The clue: It's the size of 10 refrigerators, has access to the equivalent of 200 million pages of information and knows how to answer in the form of a question. The correct response: "What is the computer IBM developed to become a 'Jeopardy!' whiz?" 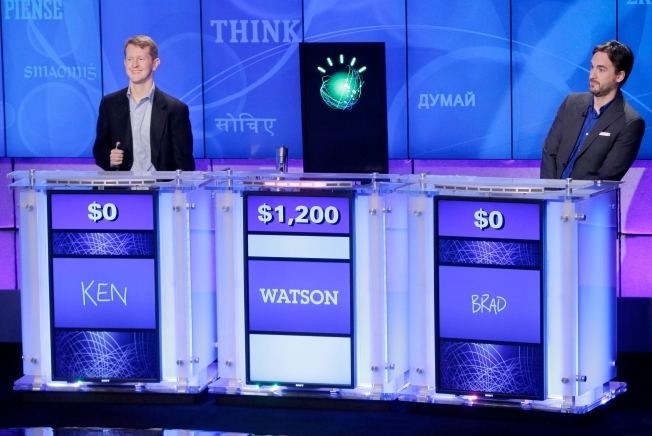 Watson, which IBM claims as a profound advance in artificial intelligence, edged out game-show champions Ken Jennings and Brad Rutter on Thursday in its first public test, a short practice round ahead of a million-dollar tournament that will be televised next month. Later, the human contestants made jokes about the "Terminator" movies and robots from the future. Indeed, four questions into the round you had to wonder if the rise of the machines was already upon us — in a trivial sense at least. Watson tore through a category about female archaeologists, repeatedly activating a mechanical button before either Ken Jennings or Brad Rutter could buzz in, then nailing the questions: "What is Jericho?" ''What is Crete?" Its gentle male voice even scored a laugh when it said, "Let's finish 'Chicks Dig Me.'" Jennings, who won a record 74 consecutive "Jeopardy!" games in 2004-05, then salvaged the category, winning $1,000 by identifying the prehistoric human skeleton Dorothy Garrod found in Israel: "What is Neanderthal?" He and Rutter, who won a record of nearly $3.3 million in prize money, had more success on questions about children's books and the initials "M.C.," though Watson knew about "Harold and the Purple Crayon" and that it was Maurice Chevalier who sang "Thank Heaven for Little Girls" in the film "Gigi." The computer pulled in $4,400 in the practice round, compared with $3,400 for Jennings and $1,200 for Rutter. Watson is powered by 10 racks of IBM servers running the Linux operating system. It's not connected to the Internet but has digested encyclopedias, dictionaries, books, news, movie scripts and more. The system is the result of four years of work by IBM researchers around the globe, and although it was designed to compete on "Jeopardy!" the technology has applications well beyond the game, said John Kelly III, IBM director of research. He said the technology could help doctors sift through massive amounts of information to draw conclusions for patient care, and could aid professionals in a wide array of other fields. "What Watson does and has demonstrated is the ability to advance the field of artificial intelligence by miles," he said. Watson, named for IBM founder Thomas J. Watson, is reminiscent of IBM's famous Deep Blue computer, which defeated chess champion Garry Kasparov in 1997. But while chess is well-defined and mathematical, "Jeopardy!" presents a more open-ended challenge involving troves of information and complexities of human language that would confound a normal computer. "Language is ambiguous; it's contextual; it's implicit," said IBM scientist David Ferrucci, a leader of the Watson team. Sorting out the context — especially in a game show filled with hints and jokes — is an enormous job for the computer, which also must analyze how certain it is of an answer and whether it should risk a guess, he said. The massive computer was not behind its podium between Jennings and Rutter; instead it was represented by an IBM Smart Planet icon on an LCD screen. The practice round was played on a stage at an IBM research center in Yorktown Heights, 38 miles north of Manhattan and across the country from the game show's home in Culver City, Calif. A real contest among the three, to be televised Feb. 14-16, will be played at IBM on Friday. The winner of the televised match will be awarded $1 million. Second place gets $300,000, third place $200,000. IBM, which has headquarters in Armonk, said it would give its winnings to charity while Jennings and Rutter said they would give away half theirs. In a question-and-answer session with reporters after the practice round, Rutter and Jennings made joking reference to the jump in technology Watson represents. "When Watson's progeny comes back to kill me from the future," Rutter said, "I have my escape route planned just in case." Jennings said someone suggested his challenge was like the legend of John Henry, the 19th-century laborer who beat a steam drill in a contest but died in the effort. Jennings prefers a comparison to "Terminator," where the hero was a little more resilient. "I had a friend tell me, 'Remember John Henry, the steel-drivin' man.' And I was like ... 'Remember John Connor!'" Jennings said. "We're gonna take this guy out!"